"Harry Houdini is just about my favorite historic character in the whole book. I have long been fascinated by Houdini, an intensely private man who somehow managed to be a buttoned-down and scholarly rabbi’s son in his private life while doing more than anyone in his day to create the modern American cult of celebrity.When I first started writing the NYPD Inquisitor books, I only planned to have Houdini appear in book one. But to be honest, I’ve enjoyed writing about him so much that I’m having a hard time saying good bye to him. So no promises, but I think he might be back sometime." 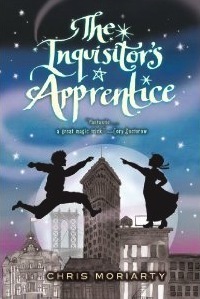 The Inquisitor's Apprentice paperback is available for purchase on Amazon. More information on the series can be found at the official Inquisitor's Apprentice website.